Threats to US and allied interests throughout the world can sometimes only be countered by US forces able to respond to a wide variety of challenges along a conflict continuum that spans from peace to war. Our national interests and the nature of crises that can occur along this continuum require our nation’s armed forces to be proficient in a wide variety of activities, tasks, missions, and operations that vary in purpose, scale, risk, and combat intensity. 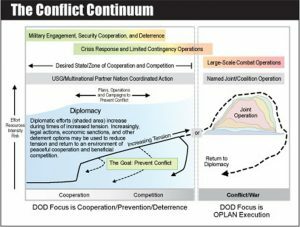 The complex nature of the strategic environment may require US forces to conduct different types of joint operations and activities simultaneously across the conflict continuum. The range of military operations is a fundamental construct that helps relate military activities and operations in scope and purpose. The potential range of military activities and operations extends from military engagement, security cooperation, and deterrence in times of relative peace up through large-scale combat operations. The graphic above shows a notional depiction of activities in an environment of cooperation and competition. DOD forces, as part of larger whole-of-government efforts, conduct operations with partners to prevent, deter, or turn back escalatory activity by adversaries. In this example, military engagement, security cooperation, and deterrence activities provide the foundation of the CCDR’s theater campaign. The goal is to prevent and deter conflict by keeping adversary activities within a desired state of cooperation and competition. Global and theater shaping increases DOD’s depth of understanding of an environment, a partner’s viewpoint of that environment, and where the US and PN have common interests. This understanding allows the US, through the relationships that have been developed, to shape the operational environment (OE). These initiatives help advance national security objectives, promote stability, prevent conflicts (or limit their severity), and reduce the risk of employing US military forces in a conflict. In an environment that is more competitive, tensions increase. A partner’s resources can enhance USG understanding of an adversary’s capabilities and intent, and expand options against the adversary. In the best case, conflict can be averted or diminished by coordinated USG/PN action. Despite the efforts to prevent or mitigate conflict, an armed conflict may occur. As conditions and objectives become more defined, Geographic Combatant Commanders (GCCs) may transition to the notional phasing construct for execution of a specific contingency operation as Figure VI-1 depicts. However, time spent “to the left” allows DOD to develop a deeper understanding of the environment to see and act ahead of conflict flashpoints, develop options, and maximize the efficiency of resources.